Pollinator Week is an annual celebration of the hard work honey bees and other insects and animals undertake every day to support our food and healthy ecosystems. This year the Honey Bee Health Coalition is marking the week by sharing our recent tools, resources and initiatives to support the industrious and indispensable honey bee. Read on below for more about each of these efforts and how you can help support honey bee health. Pollinator Week is also marked by a variety of celebrations, educational opportunities, and more. Find an event near you to celebrate honey bees and learn more about how beekeepers, farmers, and everyday people are working to support bees. Our friends at the Pollinator Partnership are tracking events throughout North America on an interactive map: www.pollinator.org/pollinator-week Varroa Guide Updates The Coalition’s Tool for Varroa Management Guide has helped thousands of beekeepers utilize best practices for detecting, monitoring, and confronting Varroa mite infestations. Given the popularity of this landmark guide, the Coalition has regularly updated it to ensure it has the best and most up-to-date information available. The Coalition recently released the 7th edition of the guide, which you can download by visiting honeybeehealthcoalition.org/varroa. Since its release, the Tools for Varroa Management Guide has been widely utilized to help beekeepers — in North America and beyond — monitor and control these destructive parasites. The guide has been downloaded more than 12,000 times. 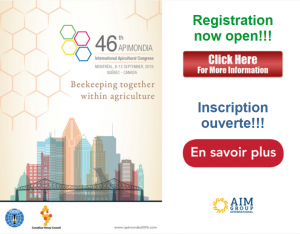 Be sure to share the guide, the related demonstration videos, and bee club presentation with your friends and fellow beekeepers. Bee Integrated Demonstration Project The Coalition’s Bee Integrated Demonstration Project launched in 2017 to show best practices in a real-world setting. Beekeepers and farmers are partnering in North Dakota to plant pollinator forage with the help of the Bee & Butterfly Habitat Fund, implement best practices from the North Dakota Pollinator Plan, and utilize the practices outlined in the Coalition’s Tools for Varroa Management Guide with support from the Bee Informed Partnership. In 2018, the project has expanded to include additional beekeeper-farmer pairs. Learn more about the Bee Integrated Demonstration Project, its supporters and key partners, and what’s next for this exciting effort by visiting honeybeehealthcoalition.org/bee-integrated. Soybean Best Management Practices Pollinator habitat and the plants bees rely upon often border soybean fields throughout North America. Soybeans can be an attractive source of pollen and nectar under certain circumstances. Earlier this year, the Coalition unveiled a series of new best management practices for soybean growers to ensure they and honey bees can continue to work together to support healthy ecosystems and the crops consumers count on. These voluntary best management practices — available at honeybeehealthcoalition.org/soybmps/ — complement information already available to growers, including mandatory pesticide label instructions and advisory warnings. Hive Management Resources The Coalition has worked with experienced beekeepers and experts to develop and vet resources to help beekeepers — professional and amateur alike — support bee health. These resources have been a huge hit with Coalition members and others around the world. Building on this success, Bee Culture Magazine’s Kim & Jim Show showcased the Coalition’s hive management resources in a recent webinar. Be sure to check out this great episode and share it with your friends. Recommendations to USDA on private lands conservation programs In May, the Coalition partnered with the Monarch Collaborative to meet with USDA Under Secretary for Farm and Foreign Agricultural Service Bill Northey in Washington, D.C. The Coalition and Monarch Collaborative highlighted the importance of the department’s private lands programs in supporting pollinator habitat on farms across the country. The two groups also urged Northey to enhance pollinator habitat in USDA private land conservation programs by improving outreach and implementation associated with these programs as well as the quality and cost-effectiveness of program specifications and habitat plantings. Click here to read the joint recommendations. Varroacide Research and Testing The Coalition announced in March that it has secured a more than $475,000 grant from the Foundation for Food and Agriculture Research to facilitate the testing of chemical compounds that could help beekeepers more effectively treat Varroa mites. This grant, matched by participants and industry members to provide more than $1 million in total support, also will document how mites develop resistance to treatments. The funding will support the identification, lab testing, and field testing over the next three years of “orphaned” chemical compounds that have known acaricidal (miticide) activity but have not been specifically tested against Varroa mites. Many of these compounds are trapped in a bottleneck where the costs of testing and commercializing them are too steep for testing, effectively leaving them on the shelf. Bee Nutrition Challenge In January, the Coalition selected four teams of researchers and innovators as the winners of the inaugural Bee Nutrition Challenge. The finalists and winners presented their ideas in a “Shark Tank”-style event at the 2018 American Bee Research Conference. Learn more about the Bee Nutrition Challenge, the winners, and information about their projects by visiting honeybeehealthcoalition.org/nutrition-challenge.